“Thomas Gainsborough: Experiments in Drawing” at the Morgan Library and Museum presents some 20 of works on paper that show a different aspect to the work of the 18th century British master. Extending at least into the 1950's, Gainsborough had a reputation as one of the world's greatest artists. In popular culture, his name was often used to evoke the idea of an extremely valuable painting (e.g., “her collection included a Gainsborough”) or a person with artistic ability (e.g., “He is no Gainsborough”). Gainsborough was primarily known for his portraits of Georgian-era British aristocrats. And as the public has become less enthralled with Georgian aristocrats, Gainsborough no longer has he god-like aura he once had. Nonetheless, he still is recognized as the top English portraitist of his era. Interest has also grown in his landscapes. The artist was no aristocrat. Born in 1727, Thomas was the youngest of ten children, His father was a weaver who encouraged the boy's interest in art. While still a teenager. He was allowed to leave home to study under an engraver in London. Gainsborough was primarily interested in landscapes. However. His landscapes did not sell well and so he began to do portraits, first in his hometown of Sudbury and later in Ipswich. His subjects were mostly local gentry and merchants. In 1759, he moved to Bath, where his work caught the attention of the aristocracy who were on holiday in the fashionable resort town. This led to royal commissions and international fame. The portraits reflected Gainsborough's study of the works of Sir Anthony Van Dyck as well as elements of the Rococo. The artist painted quickly often in low light, which gave the paintings a more romantic look. His works were not figutrd in wooden poses but rather scenes in which the subject was brought alive. Despite developing a style in which the central figure was part of a landscape, Gainsborough became tired of doing portraits and longed to just do landscapes. Unlike the Impressionists, he did not venture outdoors to capture a scene. Instead, he created models of landscapes in his studio and used his imagination to fill in the blanks. Nonetheless, his landscape paintings influenced later British artists including John Constable. In this exhibit, the Morgan shows that Gainsborough was not just a painter but also an accomplished draftsman. He produced drawings both to develop ideas for his paintings and also as finished works. They show that he did not feel bound to any one medium but often incorporated a number of media (e.g., chalk, charcoal, watercolor) in a single work to express his ideas. The landscapes often present scenes of rural folk and also vary in their extent of polish. Some are quite detailed while others such as “Woman with Three Children” and 'Wooded Landscape with Horsemen” are reminiscent of Van Gogh's drawings. Thus, the exhibition widens our view of Gainsborough. We see that beyond his well-known portrait paintings, Gainsborough experimented with different ways of expressing himself both in the media he selected and in his style. 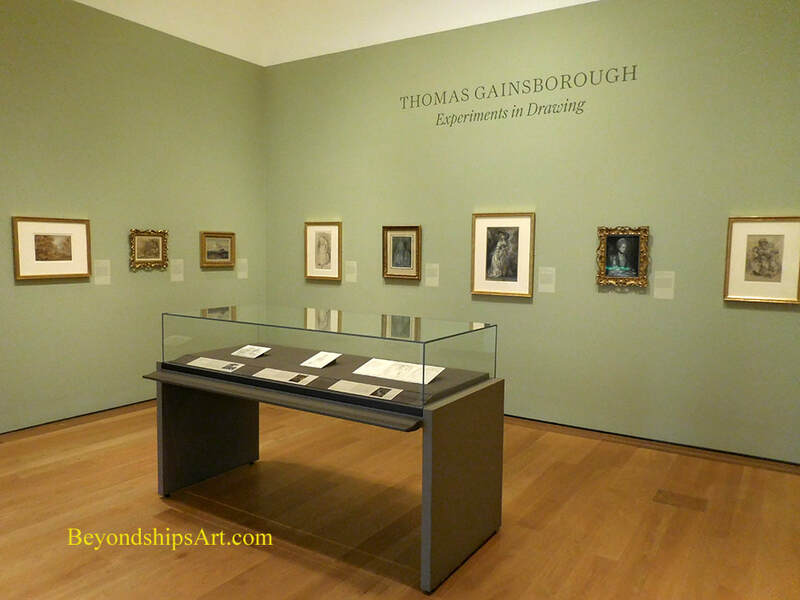 Art review - Morgan Library and Museum - "Thomas Gainsborough Experiments in Drawing"